From the time she was in high school, Janine Stange was touched by our national anthem, The Star-Spangled Banner, and all it represents. So she began singing it, and singing it, and singing it, right into the record books. 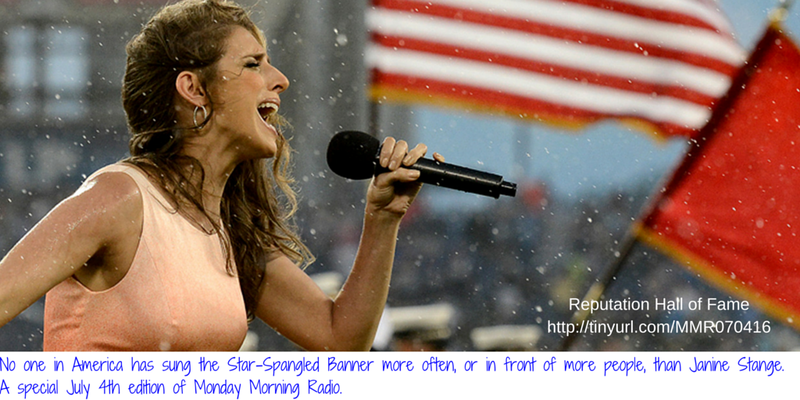 Now known as the National Anthem Girl, Janine has performed The Star-Spangled Banner publicly thousands of times, in all 50-states, in venues from Madison Square Garden to Arlington National Cemetery, and at untold numbers of major sporting events, festivals, and patriotic celebrations. In one 24-hour period in August 2015, in fact, Janine performed publicly 24 different times. For Janine, singing the national anthem is a cause, a passion, and increasingly a business. Does patriotism make for a good business platform? This week on Monday Morning Radio, Janine will address that question, as well as share with host and reputation coach Dean Rotbart what it takes to be a hall-of-fame caliber reputation builder.